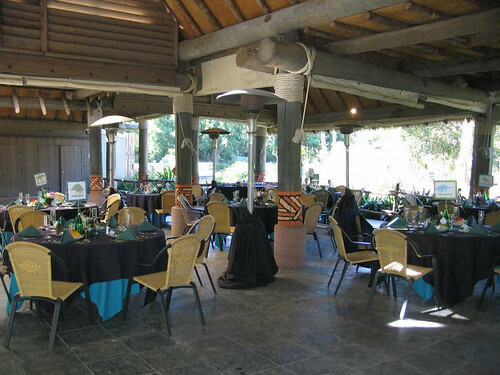 One of the hardest things about planning our wedding was finding a place for the ceremony and reception. Everything we looked at was so expensive or something we couldn't get excited about. We really wanted our wedding to be fun. We wanted it to reflect us and our wackiness, but still have a bit of tradition so it wasn't just ridiculousness. 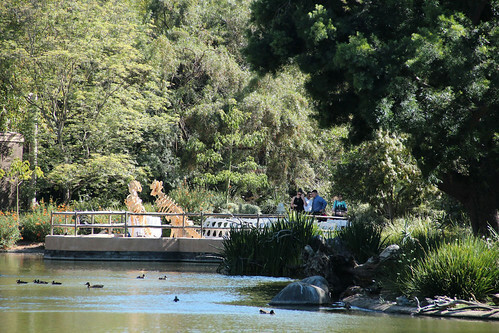 The location we eventually choose was the San Diego Zoo Safari Park, with a dinosaur theme. It couldn't have been more perfect. 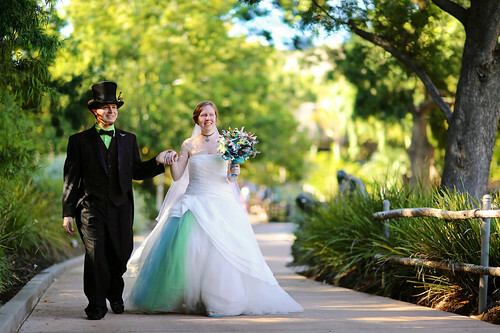 We'd checked the San Diego Zoo's wedding package on a whim. We'd been to the zoo before, and the zoo is amazing. 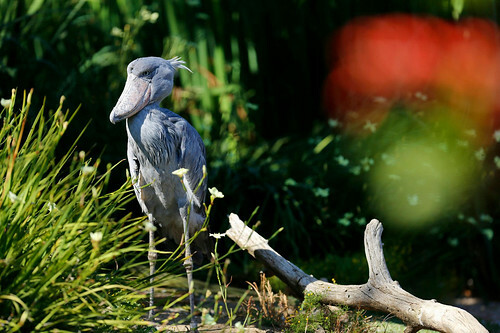 We love the San Diego Zoo. We saw the photos of their wedding ceremony and reception sites and knew it was just perfect. We emailed for prices, ready to be disappointed. We were so happy when we got a return email with the info and their wedding package was the most affordable option we'd seen and the most awesome venue by far. 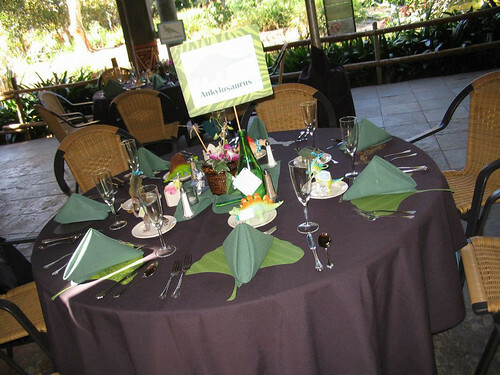 Even better, the proceeds from your event go to support the zoo and their conservation efforts. 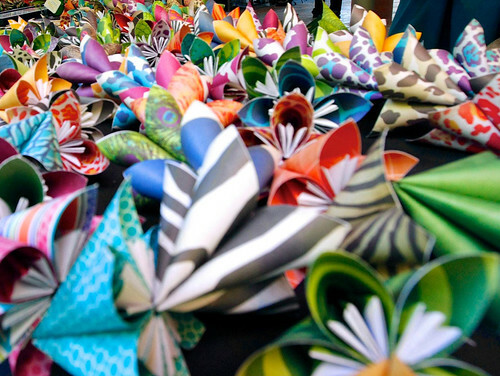 An awesome event at an amazing venue, and it supports a fantastic cause! The locations were beautiful. Above is our ceremony site at the lagoon. We asked if we could have 2 giant wooden dinosaurs that Jason wanted to make for an arch. They were totally awesome and flexible about it and even let us set them up the day before since they didn't have an event that day. I don't think may places would do that! The zoo staff was amazing. They were so friendly and helpful and enthusiastic. I really can't say enough good things about them. They did all the set up themselves and they did a lovely job. 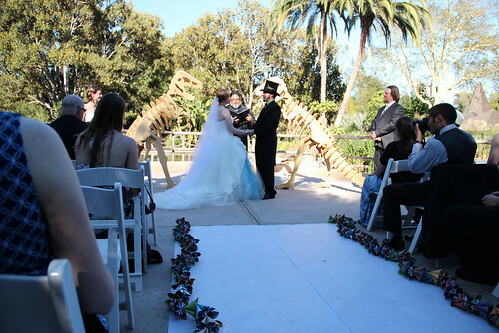 Above are photos of the reception site, one of the tables with dinosaur favors and dino signs, and the guest book table. 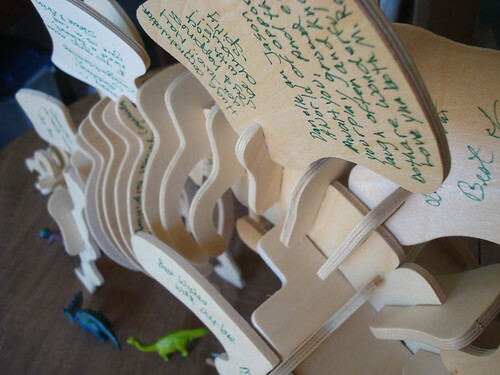 We actually used a wooden dino puzzle for our guestbook so those are the pieces laid out across the table. 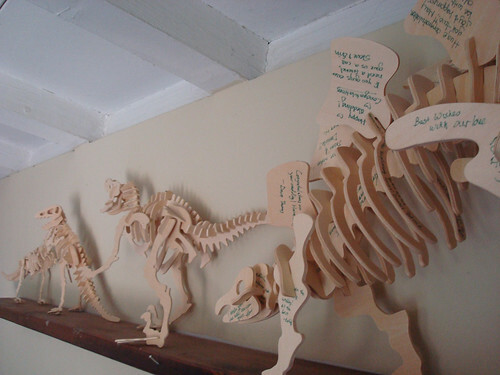 Here is a close up of the guest book and it on the shelf with all the other dinos puzzles. 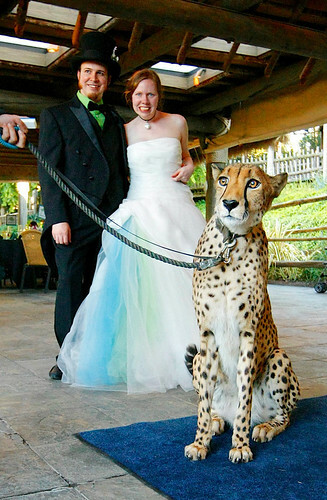 Instead of traditional wedding guest we asked for contributions to our Cheetah Fund. 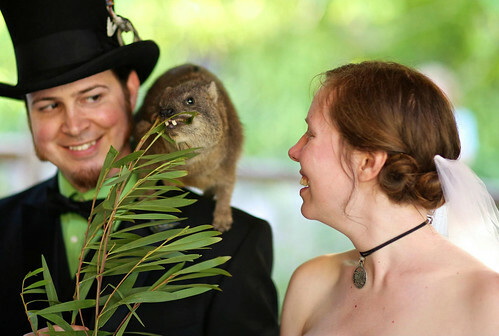 When we told people about having our wedding at a zoo they asked if there would be animals. 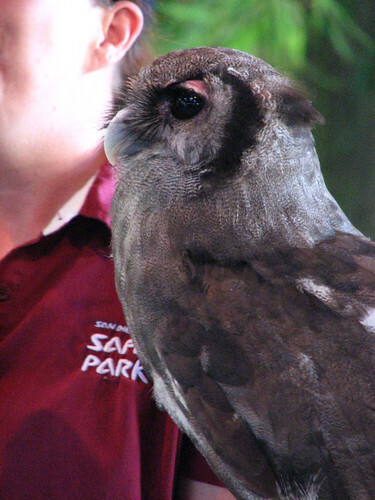 The zoo has a program where they bring some of their animal ambassadors to events and do a presentation. It wasn't something we could afford to have in our wedding budget unfortunately, but our friends were super enthusiastic about the idea and suggested we set up a way for people to contribute in lieu of gifts. Thanks to their suggestion and all their support it totally happened! It was amazing to get to see these animals up close! 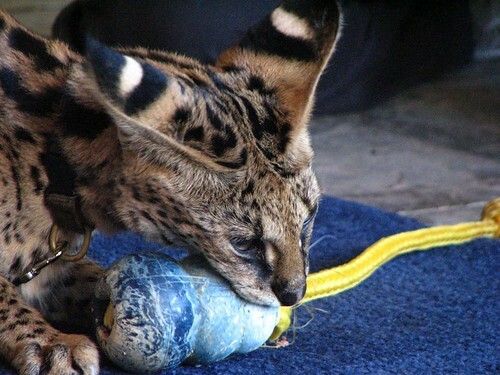 Above is the monitor lizard, Milky Eagle Owl, and African Serval. The zoo spent about 20 minutes talking and answering questions about each animal. It was an amazing experience. They even tried to take into consideration our dino theme when picking the animals. 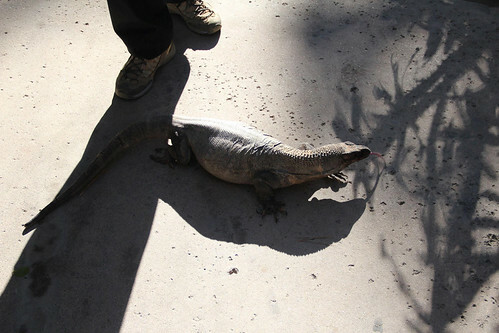 The only animal people could touch was the monitor lizard and we got to feed the hyrax. 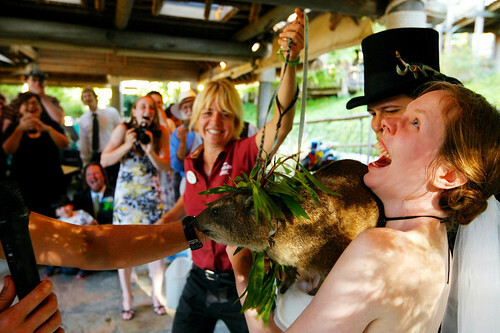 I was really surprised and excited when they let us feed the hyrax on our shoulders. So awesome! I had so much sun screen on though the hyrax couldn't get a good grip which led to some interesting photos. 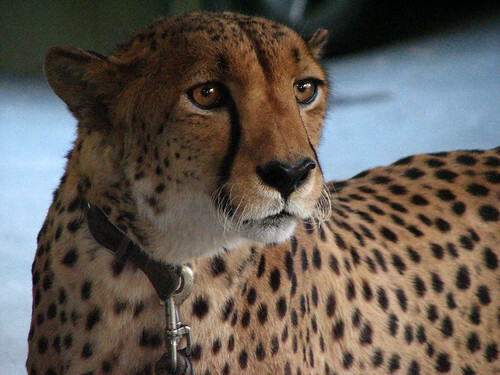 The highlight by far though was getting to meet this guy, Majani, the cheetah. Isn't he beautiful? Here's us with the cheetah. His tail totally did a swoosh under my dress. 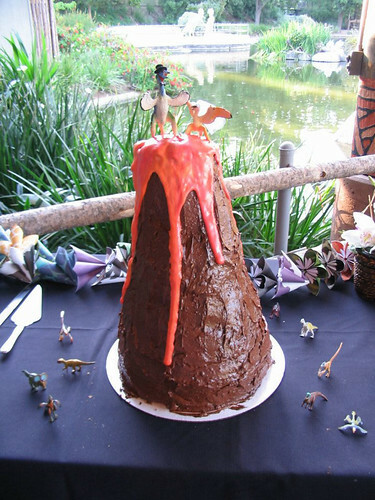 Above is the awesome cake a friend made for us. Banana, peanut butter and chocolate flavored! So delicious. 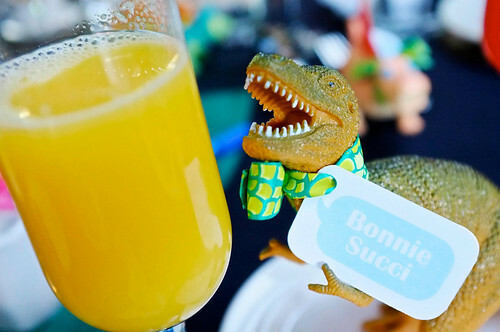 The dinosaur is the place setting and the favor. Everyone got one with their name on in. Think we had about 8 different dinos. 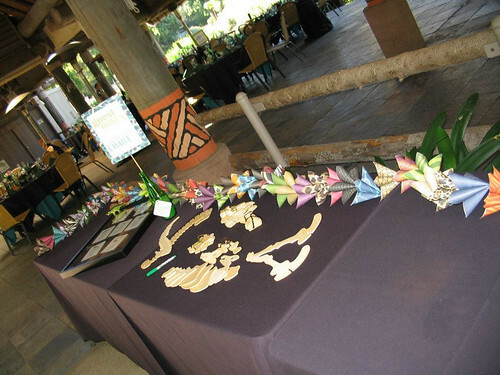 Here is a shot of the shoebill, one of the super nifty birds that lived in the lagoon and a close up of the origami we made for decorations. We mostly used animal print scrapbook paper. Fun colors and worked well with the zoo theme. Above is a pictures of us walking in together. Our music for walking in was The Imperial March (Darth Vader's theme music) and we walked out to music from Jurassic Park. For our first dance we seiously choose this song. A friend made an amazing playlist for dinner and the dancing of fun and wackiness. The other picture is of the best toast ever. 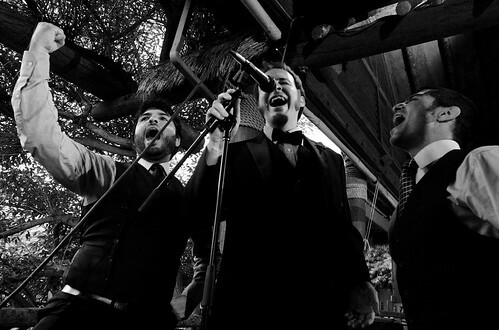 Jason's cousins started singing along to Bohemian Rhapsody instead of a regular toast. By the end of the song at least 4 others had joined in. We had a lot of fun. Everything was more than perfect. We'll eventually have a nice big album of pictures online for family and friends to see. These are collection of photos taken by guests at the wedding and from our actual wedding photographer, who was also a friend and a guest. 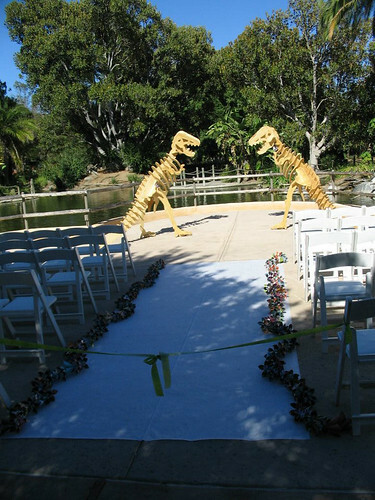 The San Diego Zoo Safari Park is a fantastic place to have a wedding. The locations are beautiful, the staff is amazingly friendly and helpful and so passionate about what they do. To top it all off, the proceeds go to a great cause. I can't recommend it enough as a venue! Home / blog / Our Wedding!